Later this month, sections of the Dalton Highway north of Fairbanks are set for five separate daylong closures as crews install new culverts. Construction closures are scheduled between miles 209 and 222. DOT says the highway will be closed from 6 a.m. to 6 p.m. on July 19, 22, 25, 28 and 31. The Department of Transportation says the culverts are needed because of what’s known as a “frozen debris lobe” that is headed toward the highway. 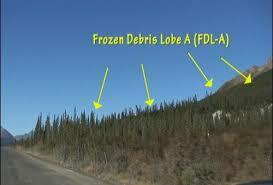 Frozen debris lobes are slow-moving landslides that occur in permafrost and contain rocks, soil, trees and ice. According to University of Alaska Fairbanks researchers, a lobe was less than 80 feet from the roadway as of Tuesday and advancing at more than half an inch per day. The Dalton is the only overland supply route to the oil fields on Alaska’s North Slope and is frequented in the summer by tourists heading to the Arctic.